Australia's Largest Waste Handling Hire Fleet. Papas is the sole Australian distributor of premium A.T.I.B. Hook Lifts, who produce one of the largest ranges of Hook Lifts in Europe. No other unit comes close when compared with other makes currently on the market. Ideal for 4x2, 6x4, 8x4 cab chassis and hook lift semi trailer applications for the collection of open top bins, compaction containers and portable compactors. 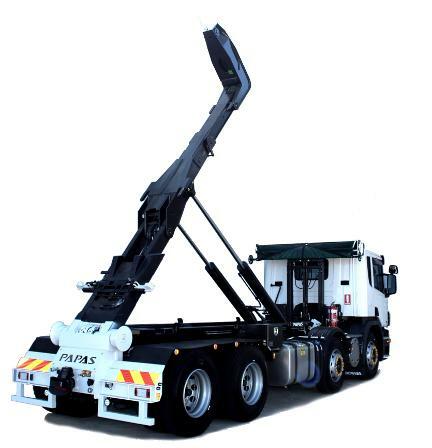 Hook lifts are a cost-effective and efficient system for the removal of bulk waste where weight may be an issue. 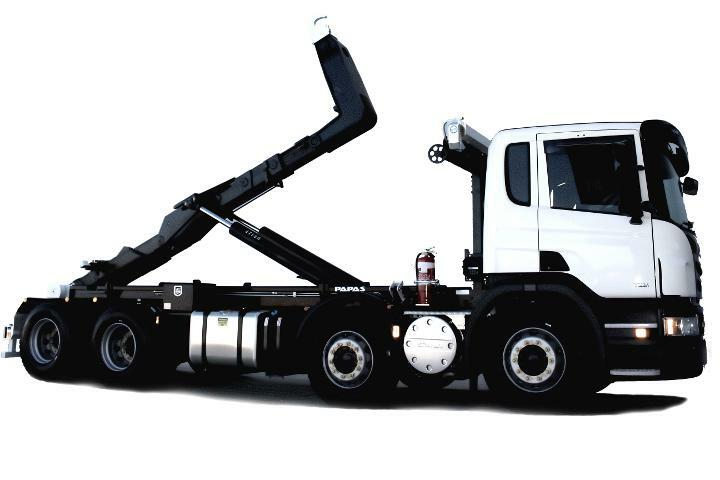 From as little as 3 right up to 30 tonne capacity, we have the ability to install your new hook lift frame on your choice of cab-chassis in as fast as two weeks. All used hook lifts come with a 12 month factory warranty. Call us on 1300 60 85 80 for more information.